DW Windsor worked closely with TfL and the City of London to agree and install traditional globe lanterns on Holborn Viaduct. 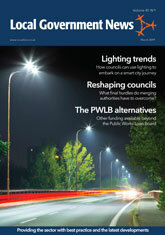 Carlisle City Council have started to reap the rewards of converting their street lighting to LED. With more energy savings to be gained, they decided to embark on an LED upgrade project for their public car parks. DW Windsor are pleased to be working with Wandsworth Borough Council (WBC) to relight their Highway Principal and Residential road network, supplying a total of 15,811 units over a one-year period. DW Windsor’s new Katana is a modular, highly versatile system of luminaires for large area, high output applications. The new Kaje bench from DW Windsor combines simple lines with robust materials.